A few weeks ago we had our second planning session of 2016. As we mentioned in our last planning update we needed to have our usual quarterly review but we also needed to finalise our overall plan for the year. It was a really tough day. Whittling down the huge laundry list of things we want to do to a list of what we can get done in just one year is always hard. It was also important to scrutinise the mix of new project work we take on and the maintenance we do, which we discuss in more detail later in this post. We’re really happy with what we’ve come up with. It’s a nice mix of finishing up some new stuff and consolidating and building on our existing projects – we make things for people, we maintain things for people. 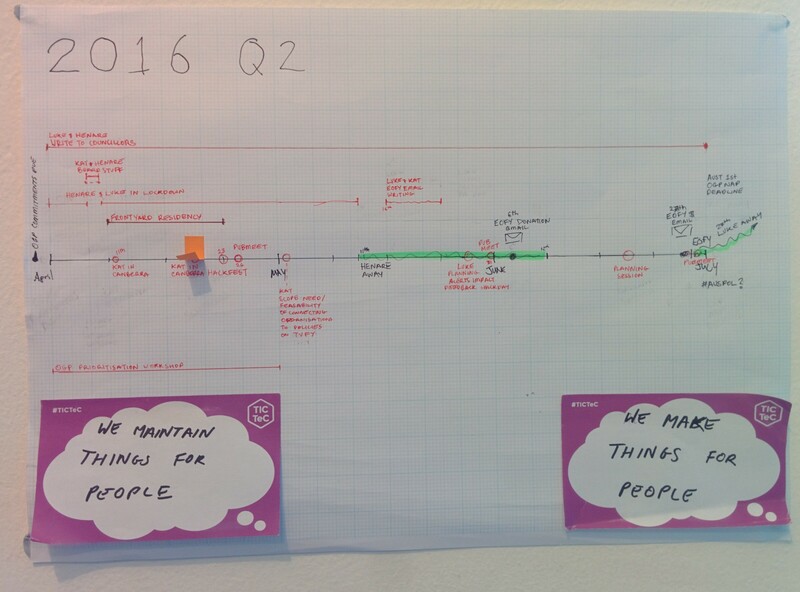 Our plan for Q2 2016. You might need to squint, or click to embiggen. Write To Councillors continues to be our focus this quarter. The project has been dragging on for a while now so we put some serious effort into creating realistic estimates and working out what’s been stopping our progress. It’s the usual story – with just two full-time staff, maintaining and supporting half a dozen major projects is difficult enough. Trying to also create new projects at the same time means there’s plenty of overhead context-switching. We’re going to be exploring ways around this so we can continue to make things for people as well as maintaining them. We’ve estimated approximately 7 weeks of effort remain on Write To Councillors for us. Spending about half our time on it means we’re due to finish up mid-July. However, in the time since we had our planning session we’ve had a major breakthrough – most of the technical infrastructure has now been created and deployed. How did this happen? Just by changing approach and quickly spiking 2 weeks worth of work in an afternoon – sometimes you need to be slow and methodical and other times you need to move fast and throw things together. It’s important to remember to make this shift early when you recognise things aren’t working. Hopefully this breakthrough will mean we finish the project a lot quicker than our estimate but for the moment we’re just focussed on getting it done. We’re currently in residence at Frontyard and we’ll have a hackfest this Saturday the 23rd of April, mainly centred on PlanningAlerts and local government. In May Henare will be giving a talk at the g0v Summit in Taipei, Taiwan. Luke’s scheduled a day to explore/hack on a prototype that gives us feedback about the use and impact of PlanningAlerts. In the lead up to the end of financial year we’ll once again be doing a call for donations (Psst, you don’t need to wait for the end of financial year). Last year we got quite a positive response and a good number of donations. This year we’ll be trying to shift this focus to recurring donations (see also our PlanningAlerts supporters project later in the year). All through July we’re scheduled to be finishing off Write To Councillors. With that live and humming we’ll move on to our next major project for the year. Our major project will be spending all of August and September working on Right To Know. The biggest priority is adding support for the remaining states of Australia and launching that. It’s a big bit of work and will make Right To Know so much more useful for so many more people. A party might be in order. We haven’t prescribed what we’ll work on after that – we want to carry out some investigation and research about what’s most useful and let that drive us. We’ve got plenty of ideas, from things like creating educational resources for people making FOI requests through to developing a guide to what makes citizen-friendly FOI laws and promoting that here and abroad. There’s also lots of work we could do to promote the use of Right To Know, from optimising AdWords through to demonstrating the project to interested groups around Australia. Last year we ran a project to see if we could get some of the many commercial users of PlanningAlerts to financially support us. Spoiler alert: they didn’t. After a number of iterations and pivots we couldn’t get it to work. While this was a blow we think we can see a positive way forward. If we can’t get commercial users to pay, maybe some of the many passionate supporters would like to chip in more regularly? You can become a morph.io supporter so why not do the same for PlanningAlerts – we know lots of people love the project and want to support its continued operation and growth. We’ll spend about 6 weeks on this starting in October. The response to They Vote For You was bigger than we expected. It turns our people really care how their representatives vote on their behalf in our nation’s parliament. So we’ll spend the end of 2016 repaying that passion by working on some improvements. Once again we’ll let research drive what this means in practice. We’ll also pick up some of the things that have been bugging researcher Micaela – as the person that works on the site the most, she’s the expert. It was great last year so to finish off the year we’ll once again get together to celebrate all of what we’ve done and the people that have helped along the way. This entry was posted in Planning and tagged donation, election, g0v Summit, Party, planning, planningalerts, Right To Know, They Vote For You, Write To Councillors. Bookmark the permalink. Post a comment or leave a trackback: Trackback URL.